Craft Stamper is the UK’s best and brightest specialised stamping magazine! 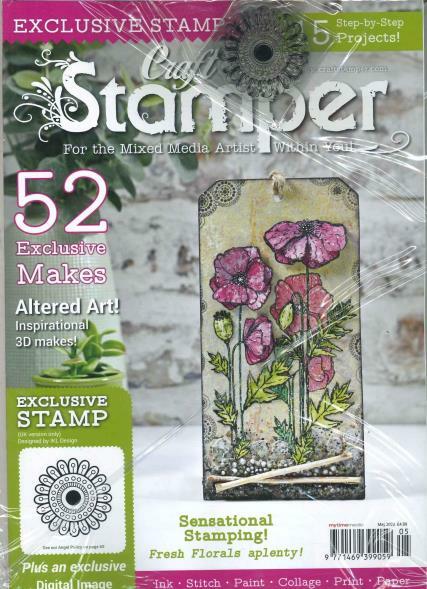 Buy a single copy or subscription to Craft Stamper magazine. In every issue, it brings an exciting mix of inspirational stamping projects, ranging from cute cards, to altered art, mini books, scrapbooking, mixed media and much more besides. Every issue of also features step-by-step projects to help you get the most from your stamping supplies and help you to discover new crafting techniques. Unlike many other magazines, we don’t just feature quick and easy makes: many of our projects are challenging, encouraging you to stretch yourself creatively. With a subscription to your favourite magazine you can save on the cover price and get the very best information direct to your door. Never miss an issue. With a subscription you'll guarantee that you'll get all the best news and reviews from the world of craft stamping delivered straight to your door. Out of all the papercraft magazines I buy every month this is my favorite. What I like about this magazine is that it shows not just stamping but all kinds of different techniques for other Things like backgrounds, flowes, jewellery, embellishments and other Things, so it never gets dull and it's one of those magazines that I will read Again and Again. It is also a great magazine for beginners as well as more advanced crafters because there are Pictures to guide you through. I will definately recommend Craft Stamper. Not sure I like the new cover layout, but the content is just as creative and interesting.